The Rescue Animal Mp3 Project, is a non profit organization founded by Pamela Fisher, DVM, a holistic veterinarian in North Canton, Ohio. The organization is dedicated to enriching the quality of life for animals in Shelters & Sanctuaries. Music arranged to promote relaxation & calm behavior along with MP3 players are donated to shelters to help the animals cope with stressful conditions & be more inviting of loving adoptions. This project is Dr. Fisher’s way of reaching out and helping more animals than only the pets she’s privileged to work with in her office. Shelter life for a rescued animal can be fearful & overwhelming. It’s well known that music can have a calming influence. Music for the project has been generously donated by various artists from around the world. Rescue Animal Mp3 Project Music is playing in 1170+ Shelters in 50 states calming more than 130,000 homeless animals. Follow up evaluations by the project show up to 95% less barking (an average of 54%) & the animals are more relaxed! We think this is a wonderful idea. 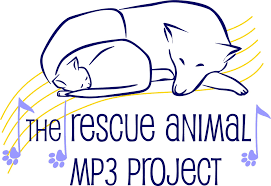 Please check out the Rescue Animal MP3 Project website, perhaps you’d like to get involved.